Pure Graphite Anti Seize/Grease | Meets All Military Specs | Superior Industries, Inc.
ASC 1700 Graphite Based Anti Seize is a premium anti seize, thread compound, and lubricant containing pure graphite. Graphite has a particular form of carbon distinguished by hexagonal crystallinity. Graphite flakes slip over one another, giving it its’ greasy feel. Graphite has long been used as a lubricant in applications where “wet” lubricants, such as oil, cannot be used. 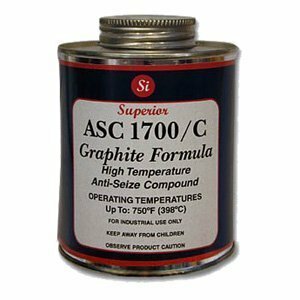 Because the atomic bond of graphite is stronger than that of diamonds, ASC 1700 Graphite Base provides super lubricity for extreme temperatures up to +900°F (482°C). Because carbon is naturally conductive, ASC 1700 Graphite Base offers excellent electrical conductive properties. These properties are largely attributed to the vast electron delocalization within the layers of carbon. This high performance product is engineered to meet or exceed United State Military Specification MIL-PRF-5544. MIL-T-5544, SAE-AMS-2518A and A50TF201. ASC – 1700 Graphite Base has a black paste like appearance and a smooth texture. The formula for ASC 1700 Graphite Base is 50% petrolatum and 50% pure graphite; Therefore, this product has excellent conductive properties. It is ideal for all types of threaded parts including spark plug threads exposed to high temperatures such as used in aircraft. This smooth creamy black paste is easy to apply and protects up to 900°F (482°C). ACS 1700 Graphite Base is ideal for the Aerospace Industry as well as most other Industrial Applications. 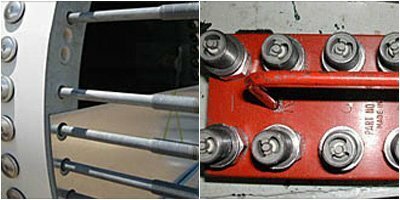 Applications Include aircraft engine spark plugs and threaded fasteners and fittings. As with most compounds that contain graphite, ASC 1700 Graphite Base may promote corrosion of Aluminum, Magnesium, ferrous Zinc and cadmium alloys and is not recommended for these metals. Regular use of this product can reduce assembly and disassembly time reducing costly downtime. It is intended to reduce wrench torque and lower friction. 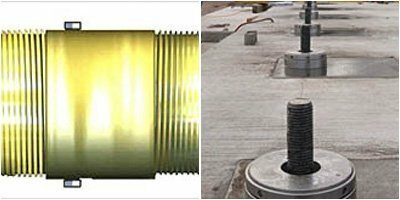 ASC 1700 Graphite Base is extremely suitable for use on Austenitic stainless steel, nickel, titanium, cobalt and other corrosion resistant alloys. A thin coat is all that is needed to protect threads. Care should be used to ensure that too heavy a coat is not being applied. Too heavy a coat can prevent proper seating of compound. Low temperatures could cause this compound to harden. ASC 1700 Graphite Base should be stored at room temperature twenty-four to forty-eight hours before application. Do not expose ASC 1700 Graphite Base to spark plug terminals or electrodes. ASC 1700 Graphite Base should be used on nuts, bolts, studs, screws, taps, pipe threads, flanges, pump and valve packings and stems, shafts, chains, levers, hinges, pivots, rollers, sprockets, and battery post. ASC – 1700 Graphite Base comes in three convenient easy to apply options. It is available in a brush top one pint cans which can be purchased in two, six, twelve and twenty-four packs. ASC 1700 Graphite Base can also be purchased in an eight pound (one gallon) cans and a forty pound (five gallon) cans. As with all petroleum base products, these lubricants should NOT be used in oxygen service. As with all petroleum base products, these lubricants should NOT be used in oxygen service.